If I can think of just one female designer who would make a good role model for young women, it would be Gabrielle Bonheur Chanel. An incredibly powerful woman who influenced fashion in a way that was liberating for women and revolutionary for the world, CHANEL made history with her creations and continues to inspire women around the world today. Recently, I had the rare pleasure of visiting the CHANEL Boutique in London. Spanning some 12,600 square feet, the CHANEL Boutique is an airy yet elegant space with a fantastic sculpture by Jean-Michel Othoniel at its centre. Inspired by CHANEL’s famous strand of pearls, this breathtaking sculpture evokes the image of the woman herself: a powerful presence that expands the height of the boutique, three floors, and disappears into the ceiling. Magnifique! 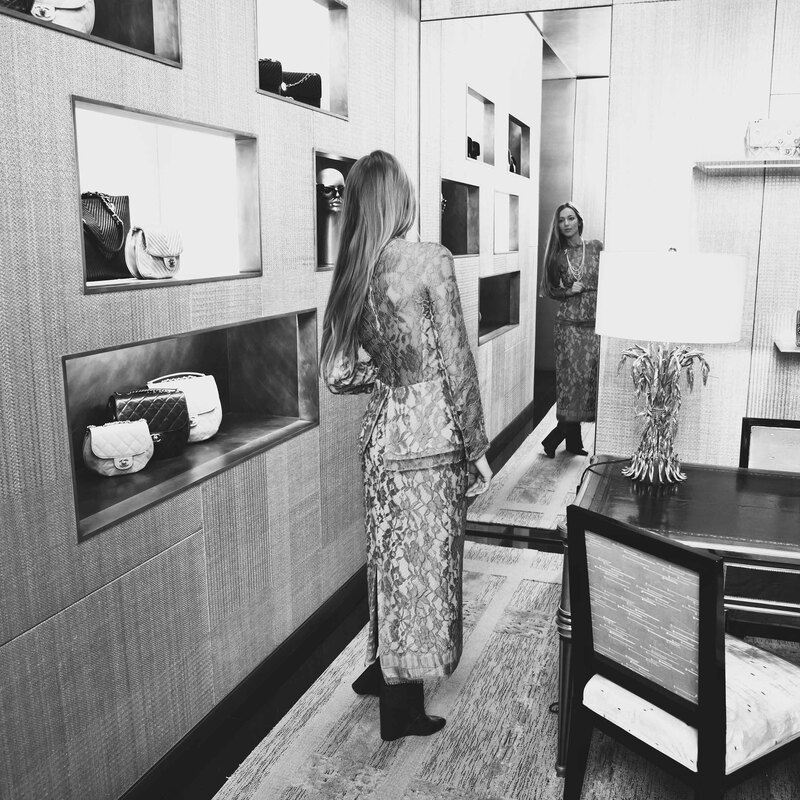 As you walk through the rooms of the CHANEL Boutique, you feel like you’re walking through Coco’s home. The beautiful way her fashions and designs are displayed amongst unique décor and luxurious furnishings is so evocative. I cannot wait to go to Paris and visit Rue Cambon, CHANEL’s legendary home. There’s an invite waiting for me, so watch out for that story coming out soon. In my usual fashion, I chose my favourite piece of all, this shooting star necklace from the Bijoux de Diamants Collection of 1932. CHANEL was designing jewellery long before any other haute couture house. She was a trendsetter with an unstoppable nature and her love for constellations matched her perspective on life: Always looking up. In this close-up, you can see all the beautiful diamonds in the tail of the comet and the studded star at its pinnacle. Emblematic of high jewellery at the time, the movement of this piece captures the freedom of expression in CHANEL’s creations. She loved to have fun with her jewellery, wearing sometimes several pieces at once and in different styles – a necklace in her hair, a broach on the shoulder. Whenever I wear a star, I am reminded of Gabrielle Bonheur Chanel and her stellar rise to the top and how her memory and influence has survived all these years. You didn’t think I could leave without buying something, did you?! If you love this emblematic jewellery, you have to check out the new Chanel jewellery collection called Comète. Thanks for stopping by. Do you know other interesting facts about Gabrielle Bonheur Chanel’s life? Leave me a message in the comments below. *Photographed by Julia Flit. Styling and Art Direction by Liza Urla. All photos belong to GEM Kreatives for GEMOLOGUE. Make-up Defaf Alamri.